There was one nice restaurant in the town where I grew up called Boder’s on the River. It was the place to go for any special occasion or event. I think the last time I was there was for my high school graduation dinner! They had a long history starting in 1929 until they closed in 2001. Amazingly, the restaurant was maintained over all of those years by several generations of the same family. The classic restaurant came to my mind recently, and I thought it would be fun to have a retro Boder’s night dinner! I cooked a few of the dishes that used to be on the menu over the years. 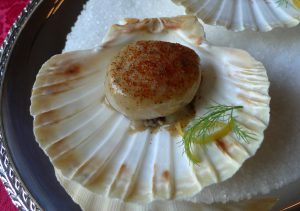 The dinner started with coquilles St.-Jacques for the appetizer. Then the main course was a crab-stuffed sole, and the grand finale was the famous schaum torte dessert. It was a fun celebration dinner, and a lovely way to make an ordinary night special! Preheat broiler. Set aside either 6 scallop shells or 6 shallow ramekins. 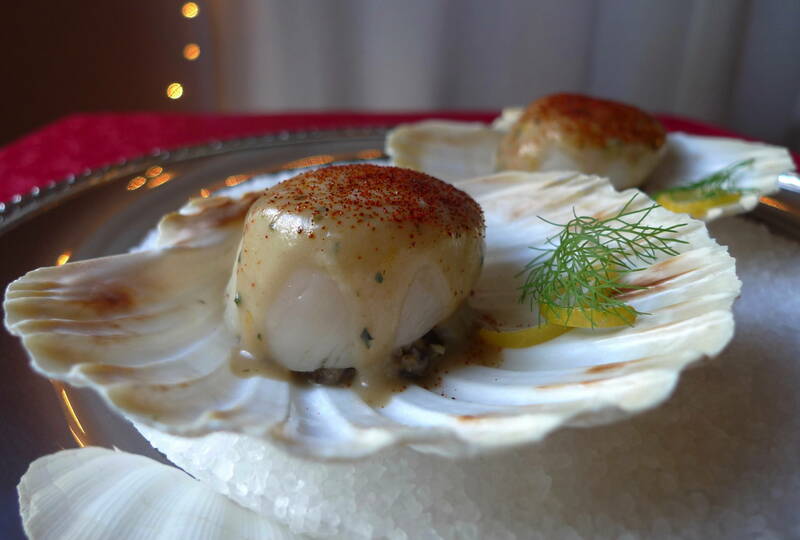 If using scallop shells rather than ramekins, crumple some aluminum foil on top of a sheet pan to keep the shells level when broiling. Over medium heat, in a medium sauté pan, melt 1 tablespoon of butter. Add the shallots, and sauté until they are translucent. Then add the mushrooms and cook until they release most of their moisture. Add the wine, and bring to a simmer. Add the scallops, and gently poach on both sides until they are just cooked through. Remove the scallops, and set aside on a plate. Strain the remaining ingredients, reserving both the liquid and the solids. In a food processor, pulse the mushrooms and shallots until they are the consistency of small pebbles. Set aside. Wipe out the pan to make sure there are no bits of mushroom or shallot left that may burn. In the same pan, melt the remaining 1 tablespoon of butter over medium heat. Once the bubbles subside, whisk in the flour to make a roux. Once the roux is golden, whisk in the milk, the strained liquid, and any liquid that may have accumulated under the scallops. While continuing to whisk, let the mixture cook until it is thickened. Strain the mixture to ensure there are no lumps. Divide the mushrooms between either scallop shells or ramekins, and spread onto the bottom of each. On top of the mushrooms, add one scallop to each shell or ramekin. Top each scallop with the sauce. Grate a little cheese over the top of each. Broil until the cheese is melted and beginning to brown. Watch very closely, because they can get too dark quickly. Remove from the broiler. To finish, sprinkle the scallops lightly with paprika.